Mrs. Martha Reed was born Martha Irvin to the late John and Sarah Smart Irvin in Clyo, GA on October 17, 1923. 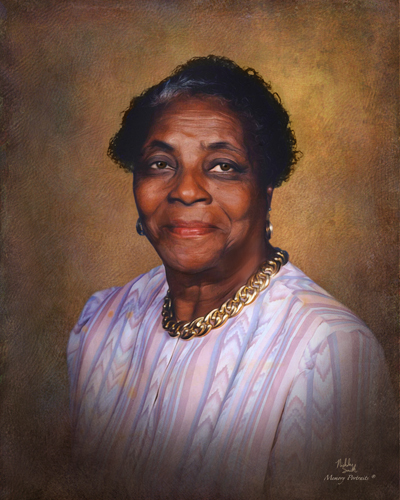 She attended schools in Effingham County, GA and relocated to Jacksonville, Florida in the 1960’s. For many years, she worked as a housekeeper. Martha joined Grace Baptist Church of East Springfield in the 1970’s, where she served on the usher board for numerous years. Martha departed this life Friday, October 26, 2018 at Cathedral Gerontology Center. In addition to her parents, she was preceded in death by her children, Wash L. Reed and Mack Reed; siblings, John Irvin, Charlie Irvin, Kary Mack, Mary Mack and Ollie Mae Johnson. She leaves to cherish her loving memories, grandchildren Lisa Baptiste, Myria Mitchell, Tiffany McCloud; great-grandchildren, LaToya Neal (L’Edric), Martin Baptiste (Marie), Alexander Kidd, Brooks Baptiste, KayLisa McCloud, Erica McCloud, Carl “Tyre” Rouse; great-great-grandchildren Michaela Baptiste, Ethan Baptiste, Morgan Baptiste, Benjamin Baptiste, and Grayson Neal; nieces, nephews, other relatives and friends. Funeral Service will be 11 AM Saturday November 3, 2018 at Grace Baptist Church of East Springfield 1553 E 21st St, Jacksonville, FL 32206 with Rev. John J. Devoe Jr. officiating. Interment will be in Evergreen Cemetery. A visitation will be held at Grace Baptist one hour prior to the Funeral Service.